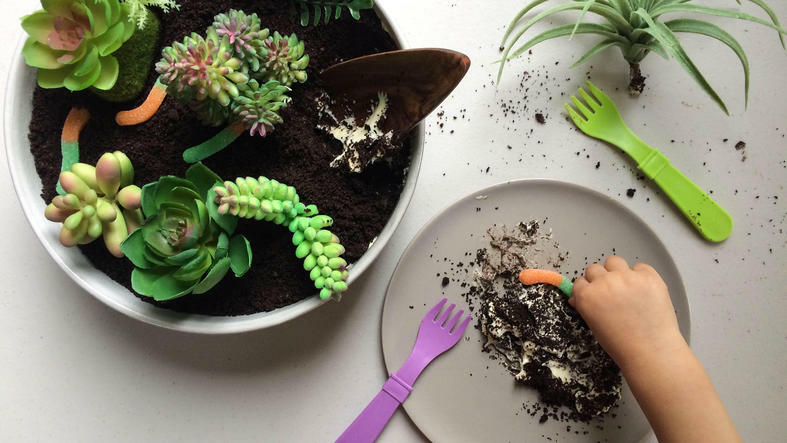 Is your first childhood encounter with Dirt Cake forever etched in your memory? Mine is. It was 4th grade. I was at a birthday party and my friend’s mom carries out this flower pot with gummy worms and a giant fake sunflower. You have to understand, up until this point, my dessert experience had been limited to European pastries and walnut rolls. My little 9-year-old mind was officially blown—what other wonders does this vast world have to offer? And then I think I spent the rest of the party trying to figure out how to nonchalantly beg the mom for the recipe. Fast forward 2 decades and my nephew is telling me, at a million miles per hour, about this awesome cake he had at a birthday party and it all came back. OMG DIRT CAKE! So when I stumbled upon no-nasty-stuff Oreos at the local co-op, I smirked and knew what they were destined for. 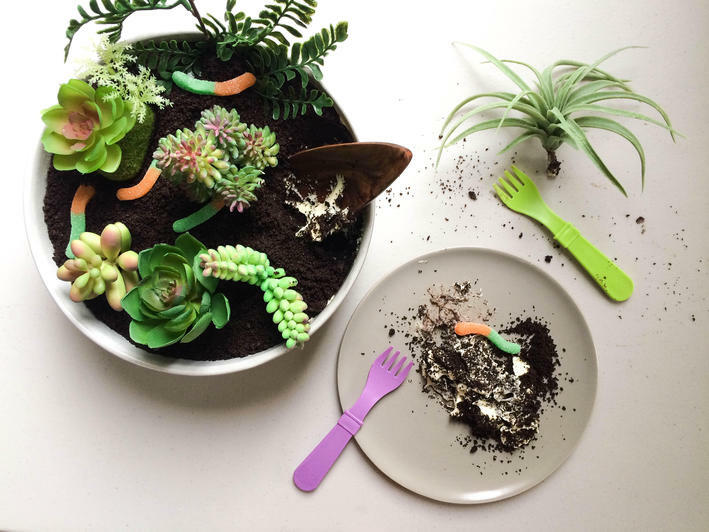 So here it is friends, a dirt cake for the new healthy hipster generation…organic Oreos and grass-fed, free-range, non-GMO everything, no instant pudding. 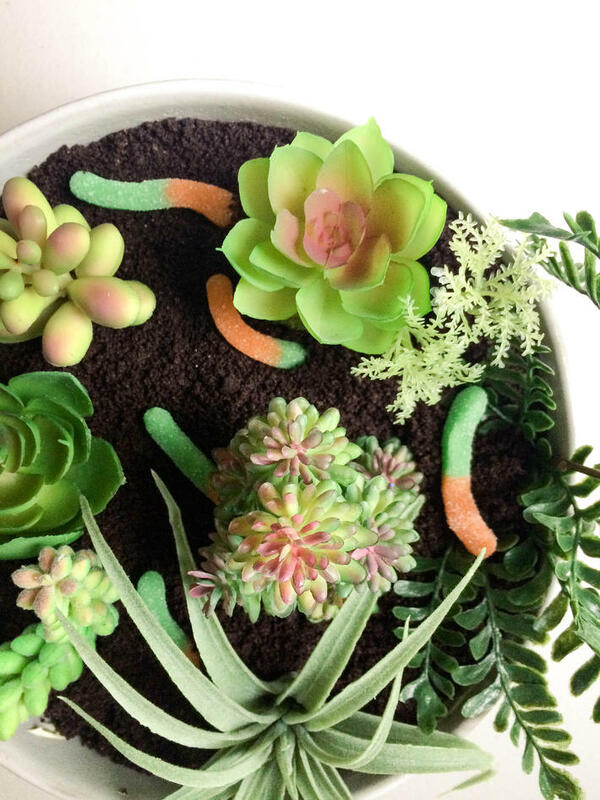 And lose the artificial flowers, that’s so 1992…plant a succulent terranium in your compost cake. 16 oz chocolate sandwich cookies—"Oreos"
In a large measuring cup, whisk the milk, egg yolks, and vanilla very well. Set aside. Whisk the sugar, cornstarch, and salt in a medium pot over medium heat. As the pan heats, slowly stream in a ½ cup of the milk mixture. Whisk until sugar is dissolved, then begin streaming in more of the milk mixture, gradually, whisking continuously until everything is well combined. Now wait a few minutes until it begins to steam, and ever-so-slightly bubble, whisking every 30 seconds for about 10 minutes or until it’s thickened and looks pudding-ish, but still a bit runny. Set aside and once it reaches room temperature, refrigerate for up to a day. It will thicken even more as it chills. In the bowl of a stand mixer (or using a hand-held mixer), add softened cream cheese and powdered sugar, beating until well-combined, about 4-5 minutes. Drizzle in several tablespoons of heavy cream (to prevent cream cheese mixture from being too stiff post-chilling) and beat for another minute. Refrigerate for an hour or stick in the freezer for 20 minutes, then secure the bowl back in the stand mixer and using the whisk attachment now, beat the remaining heavy cream until stiff peaks form. If you’re asking why not combine everything all at once? The cream cheese needs to be warm and soft so it creams well with the sugar, but then you need it to be cold so it doesn’t bring the temperature of the heavy cream down when you whip it. Stick this in the fridge until you need it, but best used the day you make it. While the pudding and whipped cream cheese are chilling, turn the cookies into dirt-like crumbs using a food processor. If you’ve got a regular-sized one, do this in 3 batches. Transfer to a bowl and set aside until needed. You can do this a day in advance too; keep covered at room temperature. Now carefully fold the whipped cream cheese into the pudding, stirring gently until well-combined. Grab a bowl or deep-sided round baking dish, about 9"-10" in diameter and at least 3½" deep (we use this one, though you can make any size work, little individual ramekins would be adorable too). Starting and ending with the crumbs, alternate layers of crumbs and cream in about 3-4 total layers, evening them out if necessary with a spatula. 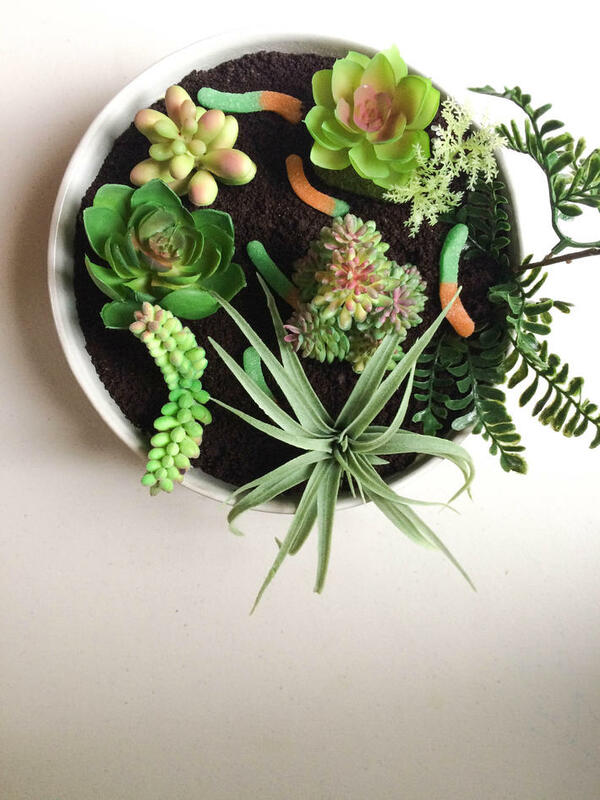 Let this set overnight in the fridge, then decorate with artificial flowers or succulents and gummy worms. A garden-shovel-like scoop for serving would take this over the top.